Delightfully vibrant works of art adroitly created by Faiza Shaikh not only brightened the mood of the visitors but also depicted the artist’s mystical journey. The launch of Faiza Shaikh’s art exhibition in Islamabad was graced by Imran Khan who took off from politics for a while to enjoy the Rumi-inspired artwork displayed at Cafe Soul in Islamabad. “Spirituality is essentially humanity and justice which is the core of all religions and human society” remarked Imran Khan at the art show which was regarded as a fine display of poetry and philosophy of canvas by the art lovers. The exhibition titled ‘music never stops’ represented celebration of life. Different variations in artist’s work, use of vibrant colours, diverse symbols, all symbolize the positivity and diversity of life. “Life never stops, it continues whatever happens. We too should continue to live and celebrate life no matter what happens” said Faiza Shaikh. Faiza’s current collection which is inspired by Rumi’s poetry, displays a dramatic interpretation of mystical journey to spiritual ascent in which the artist has beautifully connected the core themes of Islam, Buddhism and Sufism. “The central idea here is that of optimism, positivity and celebrate life in all its ways” told Faiza, who prefers to be a part of this word, by living and celebrating life, unlike contemporary artists who are usually questioning the way of life. 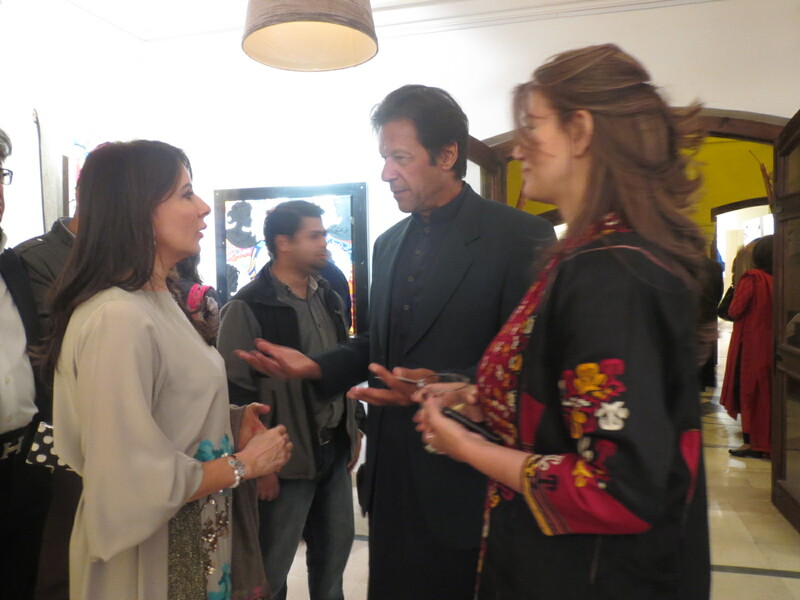 Artist Faiza Shaikh speaking to the chief guest, Imran Khan, at the launch of her art exhibition titled ‘Music Never Stops’ at Cafe Soul in Islamabad. The work that attracted the art lovers most was her signature work, recognized by the use of gold and silver lead scripted with philosophical messaged for the modern worlds. She has also used verses from the Quran in her recent collections as well as some Sanskrit text. Telling about the imagery of whirling dervishes and faceless monks in her artworks, Faiza said: The dervishes symbolically turn towards the truth through their meditation and abandon ego to arrive at perfect and connect with the divine. Faiza Shaikh, a Dubai-based artist from Karachi, is innovative in her work. Using strong, bold colors, sharp contrasts, she fuses modernity with religious philosophy. Faiza told that she has been painting ever since she has been a child but has started to exhibit her work since 2005 and surprisingly her very first exhibition was also held in Islamabad.